We are proud to present the first two creatures of our collection. We have more, but for now we want to show you these two. We hope you like it as much as we do the selection, the history of each, and the wonderful drawings of Ana Santiso, the painter of this collection. Haechi (해치), also known as Haetae, is a legendary animal of ancient Chinese and Korean mythology. 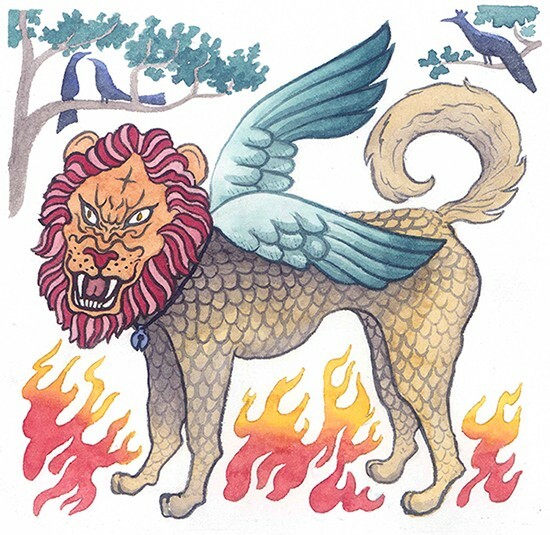 It is a dog with a lion’s head from which hangs a rattle / bell, with wings, covered with scales and capable of eating fire. That is why it is believed that Haechi protects from fires, disasters and represents justice, integrity and good fortune. Haechi’s sculptures guard the entrance of numerous palaces of Seoul, and were used in the traditional Korean architecture, especially at the beginning of the Joseon Dynasty (years 1392 to 1897), since they believed that their image was able to protect Hanyang (currently Seoul ) of natural disasters and maintain law and order in the population. 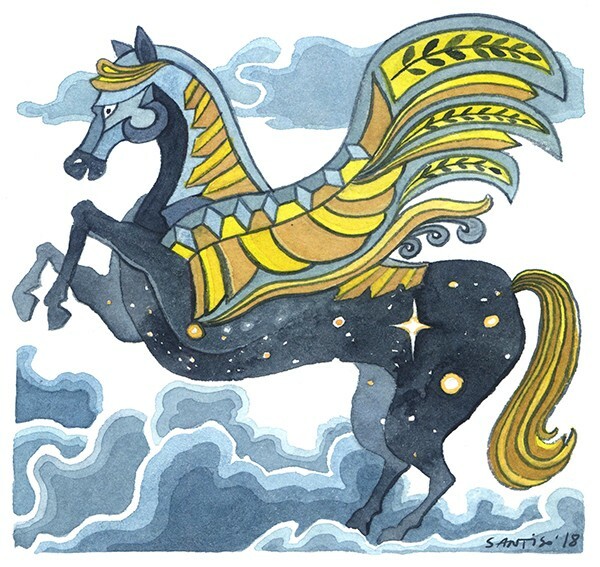 Tulpar (Тұлпар) is the legendary horse that appears in the culture of Turkic-speaking nations (Turks, Uzbeks, Kazakhs, Kyrgyz, etc. ), cultures where hunting determines the way of life. The Tulpar is half horse and half raptor. Fast as lightning, it is always linked to a human master, who helps in hunting and who is fiercely loyal. The Tulpar is part of the Kazakhstan idiosyncrasy and has been used as the symbols of Kazakhstan — the emblem of which is decorated with two golden Tulpars, the top of the yurt (the yurt is a traditional tent where the Kazakhs lived) and the sun rays. The blue background represents the sky where the Tulpars run. Decentralized Autonomous Organization for the creation of games and art services on blockchain.